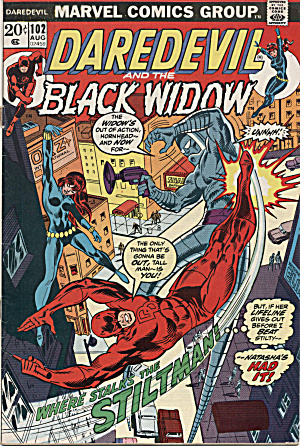 Issue 102 (Aug. 1973) of Marvel's "Daredevil and the Black Widow." I know comic grading is a science (and I don't claim to be versed in it), but here goes a description: FRONT COVER bright, no spine roll, no staple pull-out. INTERIOR: All pages present, pages supple, some light foxing, pages one shade or so off white. Great bodybuilding ad on the inside front cover!